This ultra-slim white plastic eraser is perfect for tight areas and precision erasing. Its small size also makes it extremely portable! 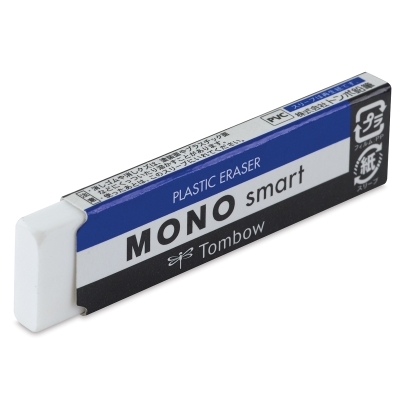 The Tombow Mono Smart Eraser measures only 5.5 mm wide, perfect for tucking into planner pockets, journals, and personal calendars. A paper sleeve with rounded corner edges keeps the eraser from being damaged during use. Phthalate-free and latex-free. 0.24" × 2.6" × 0.67" (6.35 mm × 66 mm × 17 mm).